Pollock like Damien Hurst and Mondrian was on my not sure list (which covers most 20th Century artists to be fair to Hurst and Mondrian). Until you’ve seen a variety of their work together I find it’s really hard to know if you’ll like them or not. So I went to have a look at Jackson Pollock: Blind Spots at Tate Liverpool. 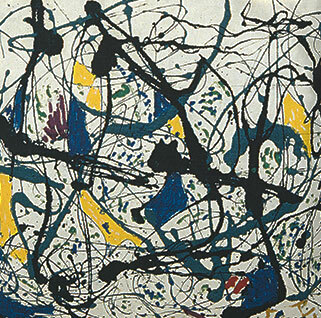 Pollock opens with a room mostly of colourful drip paintings from 1947-49. Then it moves into the black pourings period from 1951-53. In amongst the pourings are some sculptures, drawings and silk screens. I’d definitely say that on a first viewing I enjoyed the first room more although there were a few pieces in the rest of the exhibition I did like. Its strikes me as interesting that works from that first fifth of the exhibition make up half of the items Tate are selling from the exhibition. As is now common at Tate Liverpool two exhibitions on the top floor run one after the other. This time its Glenn Ligon: Encounters and Collisions which I’ll really have to go back to look at properly. Anyway since its close to work I’ll definitely be going back to take another look at this load of old Pollocks a few times over the next few months.